We are looking for the fan of speed, cars and freedom. Are you one them? Then sink into the city of real guys and cars. Drive this crazy red car and do not pay attention to other things, cause here you will not see police, pedestrians, and anything that could prevent you. 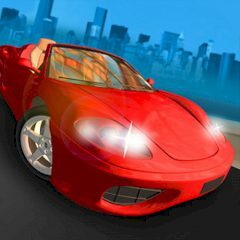 Have you ever dream to drive a stunning red convertible car around a deserted city. Is it not so cool? Duh! Be sure that you will not see any police and no one to get in your way. You have a great chance to improve your drifting skills or just drive as fast as possible. Try not ot make a crash, and just reset the game. Are you ready for such an amazing challenge, where there are no limits? Then do not waste your time and start it immediately! Step on the juice and become the champion! We wish you good luck here!